It was a warm night in 1989. I was a young lad of about 6 and I was waiting in a line that wrapped itself around the movie theater and vibrated with anticipation. My father hoisted me up to sit on his shoulders and I looked out and saw an ocean of people as far as my young eyes could see. At the end of the line was a poster which donned a symbol that would come to define a good portion of my life. THE BATMAN! Some of my earliest memories are of jumping around my living room mimicking the adventures of Adam West and Burt Ward as they rid Gotham City of evil with the cleverly placed word balloons filled with bam and pow. Little did I know the whole new world that awaited me as the line began to move and we entered the theater. Gone were the days of not being able to get rid of a bomb and in was the macabre world of Tim Burton and the subtle and tortured pathos of Michael Keaton as the Batman. The entire time I kept looking over at my dad then back at the screen and I thought to myself, “My dad is gone for most of the day while I’m at school. He could be Batman!” From that moment on whenever the rubber cowl went over Michael Keaton’s face he disappeared in my mind and my dad took his place. Because to a six year old who could possibly be a better super hero that ones own father. To me no adventure was greater than one I could share with my Dad. Thank you Luis Martinez for taking me to see Batman in theaters on opening night, and for being my father and overall the best super hero ever! 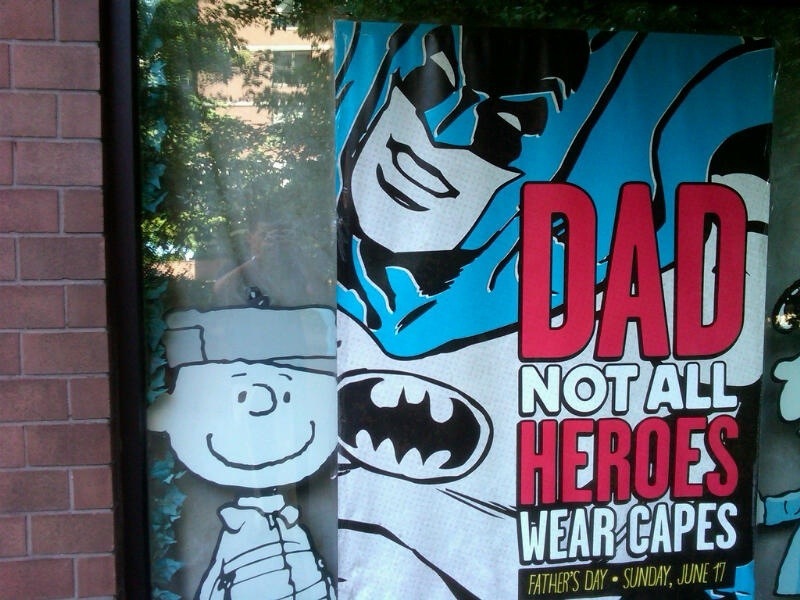 This entry was posted in Movies and tagged batman, dc comics, Father's Day, movies, reviews. Bookmark the permalink.